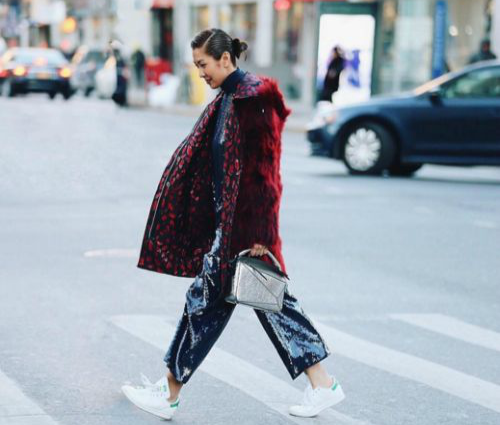 9 Fab Outfits That Look BETTER With Flats Than Heels! While you love to dress up and look gorgeous, don’t you also sometimes wish that it could also be practical? And surely nothing is more impractical than heels, especially if you are planning to walk down the roads in India! No need to fret, though, for here are 9 outfits that actually look better when styled with flat footwear rather than with heels! Image: Shutterstock Skater dresses are a version of A-line dresses which are narrower at the waist, so that you can show off your fab figure! And guess what, they look just amazing with flats! Also read: 9 Pairs Of Shoes EVERY Girl Should Have! 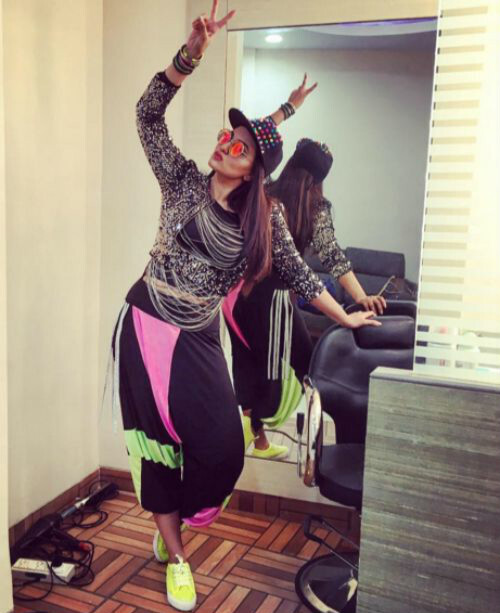 Image: Sonakshi Sinha on Instagram Harem pants are roomy, and with the right accessorising, can look oh-so-stylish! Plus, as Sonakshi will tell you, with some brightly coloured flat shoes or sneakers added to harem pants, you can so easily pull off the cool and hip look! Image: Sunny Leone on Instagram Sunny Leone manages to wow in this unevenly-hemmed dress, even as she pairs it with ballerinas. By pairing her extremely sophisticated dress with a pair of pretty casual flats, she manages to keep her look interesting - simply because this quirky combination lets us know that while she has good taste, she is not trying overly hard to impress. Take notes, girls! Also read: Are ALL Your Outfits Looking The Same? 7 Ways To Change That! Image: Banana Republic on Instagram The beauty of cropped trousers is that one can wear them for both an extremely formal event like an interview, as well as for more informal, everyday dressing. Not to mention that they look the most natural and easygoing with flat shoes. Pair them with a couple of oxford shoes for formal occasions, and with sneakers or even crocs (!) for the more casual occasions, to get both style and comfort in your bag! Image: Alia Bhatt on Instagram Wearing flats with short skirts is always a wise idea, because you don’t want to draw attention away from your lovely legs by putting in the distraction of heels! ;) When there is an ample amount of skin showing in the leg area, pairing it up with flats keeps it simple and fresh, rather than heels, which tend to make the entire look go slightly over the top! Take hints from Alia Bhatt here, who pairs her cute, short skirt with a pair of black brogues - thus, keeping it girly and super adorable! 6. Pretty much anything with bobby socks! Image: DKNY on Instagram Bobby socks are those tiny, ankle-length socks that look just so cute! Personally, I love how versatile they are, because they have the capability of enhancing the look of pretty much any outfit in a second! The more feminine ones comes with frills, as in this Donna Karan Spring 2016 look. And paired with these flat, strappy ballet shoes, they scream boho chic! Which is all which your free spirit needs! Image: Banana Republic on Instagram Who doesn’t have a pair of boyfriend jeans...your favourite pair for a relaxed day? They have a comfortable fit, and hey! Real pockets! 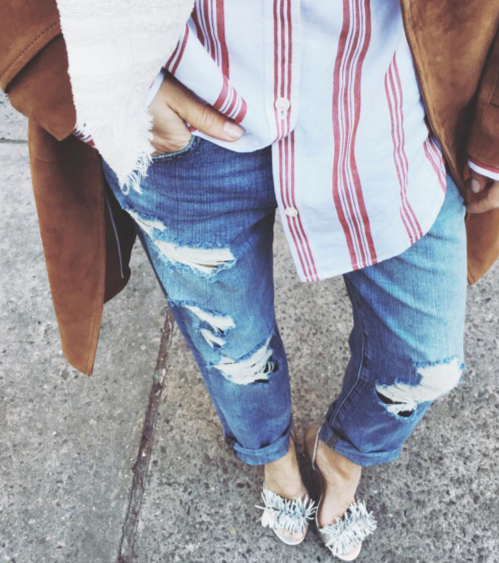 Taking styling cues from the iconic American fashion label, Banana Republic, I say - throw in a pair of glam-looking flats, and you are all good to go! Also read: What Shoes Go Best With Which Jeans? The Ultimate Guide! Image: Marc Jacobs on Instagram Some short girls think that maxi dresses are not for them. But not only is that untrue, but in fact, the right kind of maxi dress can make you look taller as well, and that too without heels! As virtuoso fashion designer Marc Jacobs shows us here in his Spring 2016 collection, a maxi dress with a high waist renders the “tall” effect. And so, walking down the street with your girlfriends this summer while looking trendy, and also keeping comfortable, became just so easy! Image: Diane von Furstenberg on Instagram Long coats pretty much always ask you to say “No” to heels. Why? Because with their length, such coats already draw the viewer’s eye vertically, making the person wearing it appear taller than they actually are. So as fashion legend Diane von Furstenberg will tell you - just add a long coat, like this Brookes coat from her label here, to your wardrobe, and you will never really need heels again! Featured Image: Shutterstock HAVE A STORY IDEA FOR POPxo? If you want to hear about it, we can write about it! Just tell us your idea here!